2 Ginger and chilli edamame, carrot and red cabbage California rolls, 3 pepper, lime and chilli hosomaki, 1 chargrilled pepper and quinoa nigiri, 1 edamame, coriander and quinoa mixed nigiri, and 1 bottle of soy sauce. A taste of Japan. Rolled vegetable California rolls, mixed nigiri and pepper hosomaki. Our sushi rice is cooked in traditional Japanese pots and seasoned. We then hand fill our rolls and hand top our nigiri with carefully selected ingredients to deliver a taste of Japan. Cooked White Sushi Rice with Quinoa, Cooked Sushi Rice with Beetroot Colour, Cooked White Sushi Rice, Pepper (7%), Edamame Soya Beans (7%), Carrot, Red Cabbage, Water, Soy Sauce Bottle, Nori Seaweed, Coriander, Rapeseed Oil, Cornflour, Ginger Purée, Brown Sugar, Glucose Syrup, Red Chilli Purée, Red Pepper, Spirit Vinegar, Lime Juice, Garlic Purée, Lemongrass, Rice Vinegar, Sugar, Lime Leaf, Galangal, Coconut Extract, Soya Bean, Salt, Concentrated Lime Juice, Coriander Seed, Chilli. 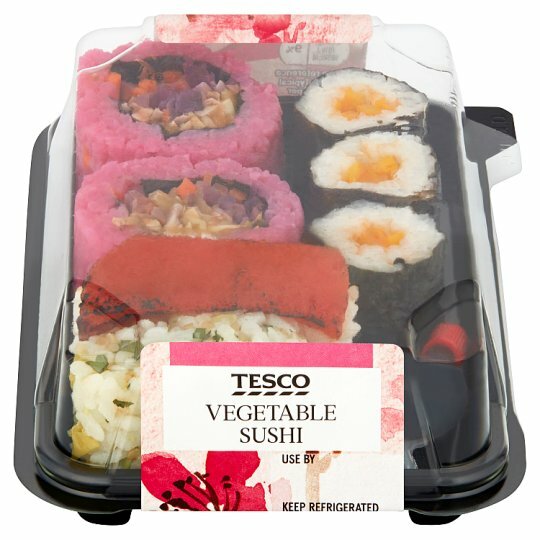 Cooked Sushi Rice with Beetroot Colour contains: Water, White Rice, Rice Vinegar, Sugar, Spirit Vinegar, Salt, Rapeseed Oil, Maltodextrin, Colour (Beetroot Red). For allergens, see ingredients in bold. Also, may contain sesame seeds.